Disciples II Gold is a complete edition containing the base game and all three expansions (Guardians of The Light, Servants of The Dark and Rise of The Elves) plus five new bonus quests. 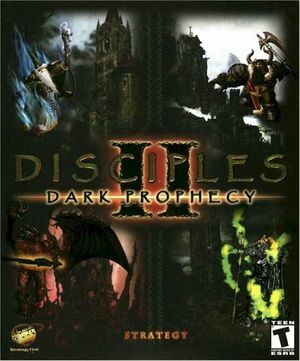 Disciples II: Gallean's Return is a compilation of the base game and two expansions (Guardians of the Light and Servants of the Dark). Although it can appear on a non-primary display, it does not capture the mouse. 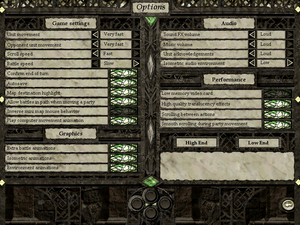 Text-based only speech in cutscenes. Retail version, download for Gallean's Return DLC and Rise of the Elves DLC. 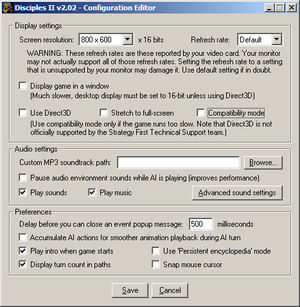 4 DirectPlay - requires IP address. ↑ 2.0 2.1 File/folder structure within this directory reflects the path(s) listed for Windows and/or Steam game data (use Wine regedit to access Windows registry paths). Games with Steam Cloud support may store data in ~/.steam/steam/userdata/<user-id>/1640/ in addition to or instead of this directory. The app ID (1640) may differ in some cases. Treat backslashes as forward slashes. See the glossary page for details.